My sweet neighbor gave me a bag of gorgeous pears. I’ve been wanting to make applesauce. It’s the perfect treat on cold days. So I decided to change it up and make pear applesauce. The pears were sweet so I decided to pair the pears with some tart Granny Smith apples. My neighbor got the pears from her CSA, so I’m not sure what kind of pears they are. Maybe someone more familiar with pears can tell what kind they are from the picture? An Instant Pot is one of the most popular brands of electric pressure cookers. 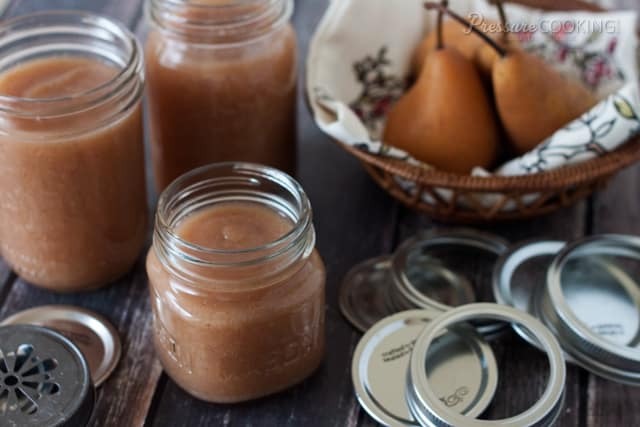 They are easy to use and your Instant Pot can help you create this delicious Pear Applesauce! Just a little disclaimer to this recipe. Some manuals don’t recommend making applesauce in your pressure cooker because it foams. Also, this recipe does not use the minimum liquid recommended by most pressure cookers. The fruit is so juicy and releases plenty of liquid as it cooks, so this recipe works well for me in my electric pressure cookers. I’ve made applesauce in the pressure cooker many times and never had a problem. Any time you think a recipe isn’t cooking as expected, don’t be afraid to unplug the pressure cooker, or remove it from the heat. If something smells like it’s burning, you need to check it. Don’t just keep cooking it because the time isn’t up. Perhaps you didn’t put the lid on quite right, or you need a new gasket, or something else went wrong. Trust your instincts. This recipe requires a natural pressure release because the hot fruit needs some rest time, so it doesn’t start to come up out of the valve when you release the pressure. Any time any thing but steam is coming out of the valve, you need to close it and just let the pressure cooker rest for a while. You don’t need to be scared if this happens, just remember that the contents is under pressure and the pressure needs to be released more slowly. If you’d rather, you can also cook applesauce in a slow cooker. In fact, one of these days I should try slow cooking applesauce using the slow cooker setting on my pressure cooker. 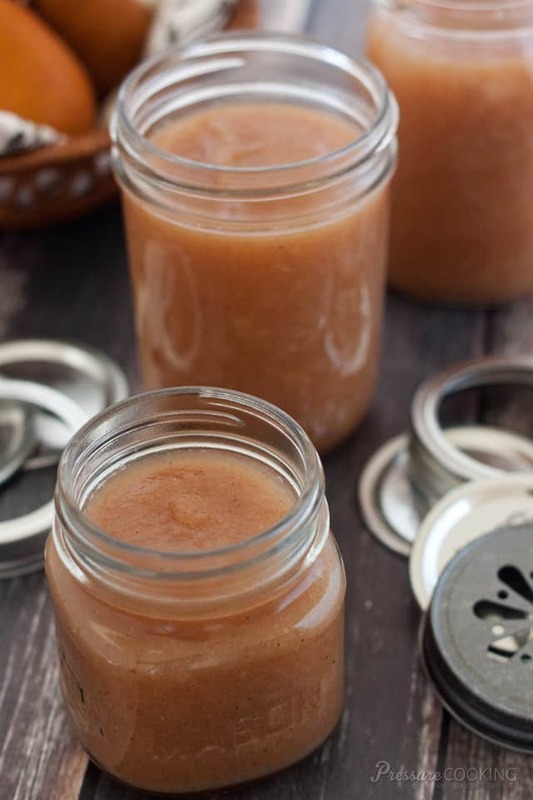 If you haven’t made homemade applesauce yet, you need to give it a try. So much better than store bought applesauce, and even more fun with the addition of pears. Place the apple and pear pieces, apple juice, and cinnamon in the pressure cooker and stir to combine. Select High Pressure and set cook time for 4 minutes. After timer beeps, turn off pressure cooker, and let the pressure release naturally. When the valve drops, carefully remove the lid. Blend the applesauce using an immersion blender in the pot until you've achieved your desired consistency. I like to leave it a little bit chunky. You could also mashed it with potato masher, or even put it in the blender if you like your applesauce very smooth. Bosc pears are a favorite of mine. Not as mealy as Bartlett, but I will use whatever organic ones I can get! I have done this with Apple Butter, and poached pears……sub a sweet red or port wine for the liquid. The color is pretty and the alcohol cooks out….but the flavor….. Making a batch tomorrow. I’ve made blueberry applesauce and cranberry applesauce in the slow cooker, and love them, but love this idea more! I find if I throw everything in the Vitamix after cooking, there’s no need to peel, and the nutritious skins are in there. Not chunky like I prefer, and I peel if it’s just apples. We’re heading into apple season and I’m looking forward to trying this! Great tip – thanks for sharing! Both those flavors sound great too. Hi Rebecca – yes, I think that would work fine and the time should be the same as long as the peaches are quartered. Was in a store that had a Blackberry Butter, when I read the label it was pear pulp and blackberry juice. I tried making it and loved it. One batch had blueberries in the mix and I called it Black and Blue sauce. Such a cute idea. Thanks for sharing Jo! Hi Barbara, do you think this would work with, we call them, “sand” pears. They are a harder pear than the normal one you find in the stores. I made this & it turned out amazing! I made a double batch, halved the quarters because they were so big & I did not peal them (and they have very thick skin) because I’m lazy 🙂 I added 2-3 tablespoons of turbinado sugar because they aren’t as sweet as regular pears (they are a cross between an hard apple and pear). I also PC it for 5 min. instead of 4 as they are so hard. I opened it and thought I made a mistake not peeling them but when I pureed them, it was delicious. I added a little cloves and a pinch of vanilla…oh my! Thanks for the update Lisa! I missed your question initially, but have never heard of sand pears. Great to know it works well even without peeling. Made the pear applesauce yesterday and it turned out perfectly. I was a little concerned that since the pears I used weren’t terribly ripe — well not only not ripe, they were hard — I thought the resulting pear applesauce might not be sweet enough. I needn’t have been concerned. Everything cooked up beautifully and the result was delicious. I used red pears and Bosc pears. I suspect any pears would work. As Carol suggested, I added 1/2 t. of vanilla to the mixture – nice touch. Instead of using an immersion blender I used my Vitamix for the cooked fruit mix. Most of it went in and I pulsed it until reasonably smooth. I dumped that in a bowl and put the remaining fruit in the Vitamix and pulsed it very briefly. Once I mixed the two mixtures together I had nice pear applesauce with a bit of texture — which is exactly what I was after. Thanks Razzy – for sharing how you blended the sauce. It sounds like a consistency I would like too. Glad you enjoyed the applesauce. I’d like to do some canning with my electric pressure cooker. Can anyone recommend a good cookbook, or even a guide? Hi Barbara – you’ll want to read this article http://www.hippressurecooking.com/consumer-alert-no-pressure-canning-in-un-tested-multi-cookers/. As far as I know, no electric pressure cookers have been approved for pressure canning. I’m thinking these would make lovely homemade gifts for the holidays, too. Beautiful! What a fabulous idea-and a winning combination too. I’ve got apples galore here for some reason that need to all get merged together into some applesauce. I’ll have to take a peek at the grocery store to see how the pears look-a mix of both fruits will be a nice change from plain applesauce. I too love that there’s no added sugar. I like adding a touch of vanilla to applesauce-learned that from my Mom and do it to this day. Thanks Barbara-another great recipe for my pressure cooker. Thanks Carol! How nice to have apples galore. I’ll have to try adding vanilla; it makes everything taste just a little better. They’re Bosc Barbara. I love Comice pears. They’re the one that Harry and David puts in their gift boxes and they are buttery and not as sweet. I have never combined pears and apples although I make applesauce every year. Thanks for the inspiration. Hi Bonnie – it’s been too long since we’ve seen each other. I’ve only had the Harry and David pears once and loved them. So now I know I love Comice pears too. The pares look like Bosc. but other people probably have written in by now to tell you for sure. Thanks K! I love your sweet comment. Pears in applesauce! Wonderful! I am truly looking forward to trying your recipe. Please tell me, there is no sugar mentioned in the ingredients, but the directions call for adding the cinnamon & sugar. Thank you! Thanks Carolyn – that was left over from the applesauce recipe. I’ve updated the directions. I agree Erin, they’re Bosc pears. I’m looking forward to trying this, but probably with my favorite Comice pears. I love the idea of a pear applesauce and one with no added sugar. So many commercial applesauces are too sweet for my taste. Barbara, I also love your photographs. They add so much to the articles you write and make one really want to make the recipes. What a sweet compliment. Thank you! I’ve really been working on my photography. Now I want to find some Comice pears and give them a try. I was introduced to Comice pears by the produce man at The Fresh Market about a year ago. They’re not always available but I enjoy them when I can find them. Razzy is right, your photos really are striking. I meant to say something last time but forgot. 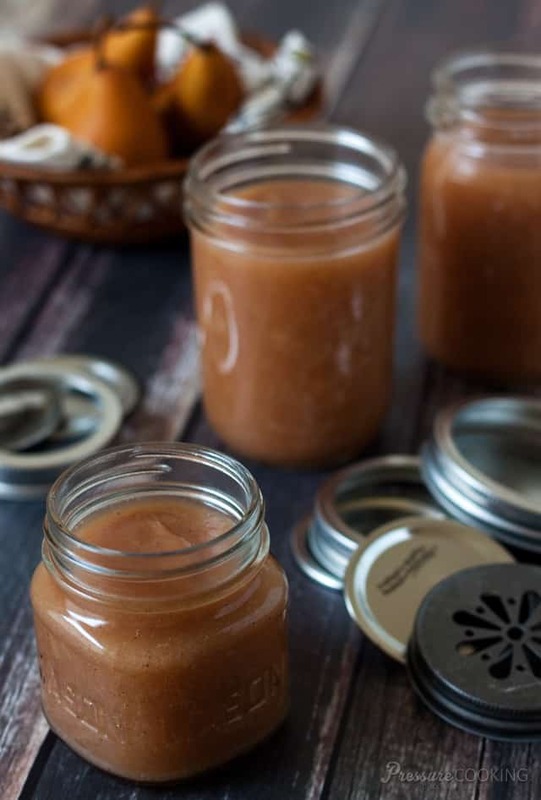 The color of the applesauce is so warm and luscious, and the texture is perfect, too. Ooh, lucky! Our friends gave us some Bartletts last year which I used to make jam, and it was one of my favorite jams I’ve ever made. I wish I had thought to do applesauce! I’ll hang onto your (no sugar! thank you!) recipe until I can get my hands on some decent pears. Also, the ones in your picture are Bosc. They are my FAVORITE since they are denser than other pears, so, better to eat fresh and also good for baking. And so pretty with their long stems. Thanks Erin! I knew my readers would know. They really are a pretty pear. I couldn’t resist putting them in the picture. I hope you enjoy the applesauce. I made homemade pear sauce using a pot and the stove top. I loved it, lost the recipe and cannot find it. Thank you for this one I know it will be fabulous! Pear sauce is way better than apple sauce. I will definitely try this very soon. Thanks Rose! Definitely better than plain apple sauce. Enjoy! Try anise oil instead of vanilla.